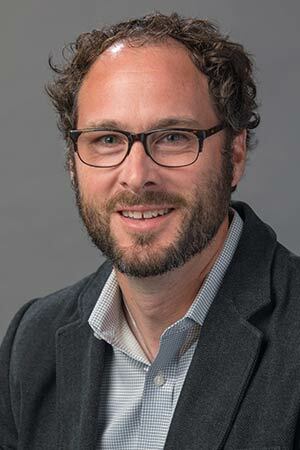 Troy Skwor’s research focuses on antibiotic resistance within different bacterial populations, especially a group of bacteria known as aeromonads. These bacteria are found ubiquitously in nature, especially in freshwater ecosystems. However, they have been associated with a wide array of human diseases ranging from diarrhea to wound infections to severe forms of disease, like necrotizing fasciitis. Besides being ubiquitous in nature, the rapid acquisition of antibiotic resistance against a broad array of antibiotics can present a clinical challenge. Additionally, it can serve as a vehicle to transfer antibiotic resistant genes to other pathogenic bacteria. His studies utilize various molecular methods to detect antibiotic resistant mechanisms and their potential to be pathogenic to humans. Another aspect of his research is studying alternative treatments against the bacterial populations with an emphasis on photodynamic therapy. This type of therapy uses a chemical, known as photosensitizers, in the presence of different wavelengths of light and oxygen, resulting in the production of reactive oxygen species capable of killing bacteria and cancer cells. He has a strong interest in mentoring students and helping them develop thought processes to think empirically about the research projects, as well as life. Skwor, T., & Kralova, S. (In Press). Aeromonas. Food Microbiology: Fundamentals and Frontiers, 5. American Society for Microbiology. Gheewala, T., Skwor, T., & Munirathinam, G. (2018, March). Photodynamic therapy using pheophorbide and 670 nm LEDs exhibits anti-cancer effects in-vitro in androgen dependent prostate cancer. Photodiagnosis and Photodynamic Therapy, 21, 130-137. Gheewala, T., Skwor, T., & Munirathinam, G. (2017, May). Photosensitizers in prostate cancer therapy. Oncotarget, 8(18). Skwor, T., Klemm, S., Zhang, H., Schardt, B., Blaszczyk, S., & Bork, M. A. (2016, December). Photodynamic inactivation of methicillin-resistant Staphylococcus aureus and Escherichia coli: A metalloporphyrin comparison. Journal of Photochemistry and Photobiology B: Biology, 165, 51-57. Skwor, T., Shinko, J., Augustyniak, A., Gee, C., & Andraso, G. (2014, February). Aeromonas hydrophila and Aeromonas veronii Predominate among Potentially Pathogenic Ciprofloxacin- and Tetracycline-Resistant Aeromonas Isolates from Lake Erie. Applied and Environmental Microbiology, 80(3), 841-848. Skwor, T., & Dean, D. (2013). Chlamydiaceae. McKee, M. L., & de Filppis I (Eds.). Molecular Typing in Bacterial Infections. Humana Press, Inc.
Wasson, C. J., Zourelias, J. L., Aardsma, N. A., Eells, J. T., Ganger, M. T., Schober, J. M., & Skwor, T. (2012). Inhibitory effects of 405 nm irradiation on Chlamydia trachomatis growth and characterization of the ensuing inflammatory response in HeLa cells. BMC Microbiology, 12(1), 176. Skwor, T. (2012). The Use of DNASTAR Lasergene Educational Software with Molecular Techniques to Support Bacterial Identification. 33, 327-334. Skwor, T., Kandel, R. P., Basravi, S., Khan, A., Sharma, B., & Dean, D. (2010, October (4th Quarter/Autumn)). Characterization of Humoral Immune Responses to Chlamydial HSP60, CPAF, and CT795 in Inflammatory and Severe Trachoma. Investigative Opthalmology & Visual Science, 51(10), 5128. Allen, S. S., Mackie, J. T., Russell, K., Jeevan, A., Skwor, T., & McMurray, D. N. (2008, September). Altered inflammatory responses following transforming growth factor-β neutralization in experimental guinea pig tuberculous pleurisy. Tuberculosis, 88(5), 430-436. Atik, B., Skwor, T., Kandel, R. P., Sharma, B., Adhikari, H. K., Steiner, L., Erlich, H., & Dean, D. (2008, October (4th Quarter/Autumn)). Identification of Novel Single Nucleotide Polymorphisms in Inflammatory Genes as Risk Factors Associated with Trachomatous Trichiasis. Toland, Amanda Ewart (Ed.). PLoS ONE, 3(10), e3600. Skwor, T., Atik, B., Kandel, R. P., Adhikari, H. K., Sharma, B., & Dean, D. (2008, July (3rd Quarter/Summer)). Role of Secreted Conjunctival Mucosal Cytokine and Chemokine Proteins in Different Stages of Trachomatous Disease. Ko, Albert I. (Ed.). PLoS Neglected Tropical Diseases, 2(7), e264. Skwor, T., Sedberry Allen, S., Mackie, J. T., Russell, K., Berghman, L. R., & McMurray, D. N. (2006, November). BCG vaccination of guinea pigs modulates Mycobacterium tuberculosis-induced CCL5 (RANTES) production in vitro and in vivo. Tuberculosis, 86(6), 419-429. Jeevan, A., McFarland, C. T., Yoshimura, T., Skwor, T., Cho, H., Lasco, T., & McMurray, D. N. (2006, January (1st Quarter/Winter)). Production and Characterization of Guinea Pig Recombinant Gamma Interferon and Its Effect on Macrophage Activation. Infection and Immunity, 74(1), 213-224. McMurray, D., Allen, S., Jeevan, A., Lasco, T., Cho, H., Skwor, T., Yamamoto, T., McFarland, C., & Yoshimura, T. (2005, September). Vaccine-induced cytokine responses in a guinea pig model of pulmonary tuberculosis. Tuberculosis, 85(5-6), 295-301. Skwor, T., Avery, H., Leviskas, B., Bork, M., Valyi-Nagy, T., & Valyi-Nagy, K. (June 2017). Novel metalloporphyrin demonstrates strong oncolytic activity against melanoma cells in two- and three-dimensional cultures. 16th Annual International Photodynamic Association World Congress, Coimbra, Portugal. Skwor, T. (June 2014). A. veronii and A. hydrophila predominate among multi‐drug resistant, cytotoxic isolates from human wastewater effluents and local riverine ecosystems. 11th International Symposium on Aeromonas and Plesiomonas, Montpellier, France. Skwor, T. (March 2014). Identifying Human Pathogenic Multi-Drug Resistant Bacteria from Local Wastewater Post-Chlorinated Effluents Compared to Rock River: A Two Year Longitudal Study. Watercon, Springfield, IL. Skwor, T., Haggerty, J., Johnson, J., Fomina, C., Stringer, S., Johnson, M., & McFall, L. (2013). Prevalence of Antibiotic Resistant Aeromonas: A Comparison Between the Rock River and the Rock River Water Reclamation District. 86th Annual Water Environment Federation Technical Exhibition and Conference, Chicago, IL. Skwor, T. (2013). Comparison of potentially pathogenic antibiotic resistant strains of Aeromonas bacteria within the Rockford Water Reclamation District and the local Rock River. Watercon Conference, Springfield, IL. Skwor, T. (2011). Development of cheaper, easier and quicker molecular methods with computer software, DNAStar, to aid in determining bacterial identification for classroom application. Association of Biology Laboratory Education conference at New Mexico State University, Las Cruces, NM. Schober, J., Delost, G., & Skwor, T. (2011). Prevention and Disruption of Biofilm of Escherichia coli, Pseudomonas aeroginosa and Staphylococcus epidermidis by Aqueous Silver. , Boston, MA. Zourelias, J., Wasson, C., & Skwor, T. (2010). Characterization of IL-6 Production between Upper and Lower Reproductive Tract Epithelial Cells Infected with Chlamydia trachomatis. , San Diego, CA. Skwor, T. (2010). Characterizing phenotypic and molecular virulence factors in antibiotic resistant Aeromonads from Presque Isle Bay. , Erie, PA.
Skwor, T., Attarwala, A., Ghaffari, A., Xu, E., Dani, A., & Dean, D. (2009). Chlamydia trachomatis reference and clinical strain infection of primary stromal cells in a human endometrial explant system. Chlamydia Basic Research Symposium, Little Rock, AR. Atik, B., Skwor, T., Kandel, R. P., Sharma, B., & Dean, D. (2008). Single nucleotide polymorphisms (SNPs) among inflammatory genes are associated with patients with trachomatous trichiasis. , . Skwor, T., Atik, B., Kandel, R. P., Atakari, H. K., Sharma, B., & Dean, D. (2007). Conjunctival immune response in trachoma: Role of cytokines and chemokines in progressive stages of clinical disease. Bay Area Clinical Research Symposium, San Francisco, CA. Skwor, T. (2007). Immune Mediators Associated with Chlamydia trachomatis Serovar E Infected Human Peripheral Blood Mononuclear Cells and THP-1 Monocytic Cells. International Chlamydial Basic Research Conference, Louisville, KY.
Skwor, T., Li, A., Economidis, M., McDonough, C., & Dean, D. (2006). Ex vivo Human Endometrial Explant Model of Chlamydia trachomatis Infections. Children’s Hospital Oakland Research Institute Research Symposium, Oakland, CA. Jeevan, A., McFarland, C. T., Yoshimura, T., Skwor, T., Lasco, T., & McMurray, D. N. (2004). Production and characterization of guinea pig recombinant IFN gamma: Effect on MHC II expression and growth of Mycobacterium tuberculosis in macrophages. International Symposium on Emerging Trends in Tuberculosis Research, New Delhi, India.